reflect their experience as a minority in the small, predominantly Christian villages that were scattered along the banks of the Rhine River. 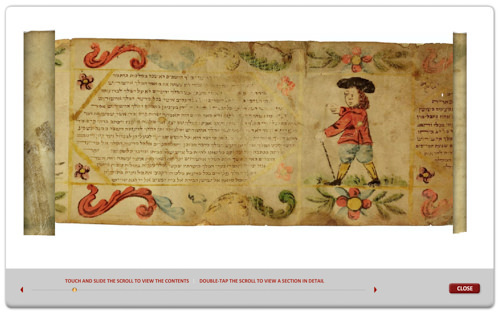 The character of Alsatian Jewish life is captured in the ornamentation of this megillah. The whimsical imagery includes peasant figures in colorful local costume and reflections of folk humor. In this small scroll, the Hebrew text is arranged with- in octagonal frames approximately 60 mm high. Each column of text is bordered above and below by bands of scrolling vines. Lively figures, several shown strolling with walking sticks in hand and others gesturing, are interspersed with human busts, owls, and a gargoyle. These fanciful images appear to bear no specific relationship to the Esther story. 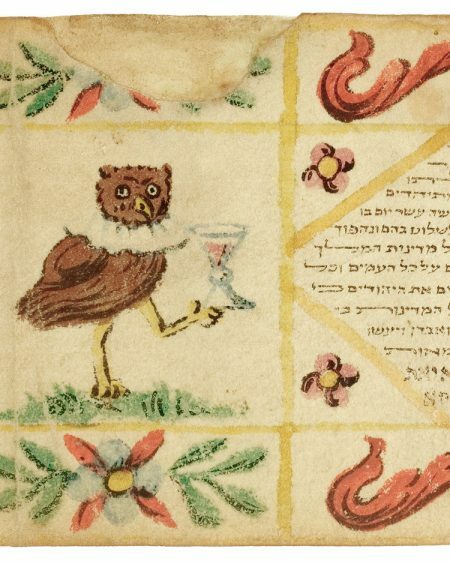 The owls, dressed in ruffs and hats and holding wine goblets, however, may well be an illustration of a European proverb, “drunk as an owl.” Depictions of imbibing owls may allude to the Purim tradition of drinking until one can no longer tell the difference between villainous Haman and virtuous Mordecai. The few known Alsatian megillot share several distinctive characteristics: a bright palette of yellow, red, and green; stocky, robust figures; and large, vibrant flowers. These scrolls are of interest for their display of distinctive local costume. In the Braginsky Collection megillah the women wear red or blue garments with yellow corselets laced in front. One woman wears a simple white cap with ruffled edges, and a solid yellow skirt covered with a plain white apron of a type that was worn throughout Alsace. The men are depicted wearing traditional white ruffs, red or blue jackets with culottes, stockings, low-heeled shoes, and a variety of hats. The names of Haman’s sons appear in an unconventional format. Traditionally the ten names are presented vertically in their own separate column, symbolizing a poorly built structure that will not last. In this megillah the names of the ten sons, which appear at the bottom of a column of text, are written in continuous horizontal lines as is the rest of the work. They are distinguished only by the slightly larger script used. Klagsbald 1981, pp. 68–71; Sotheby’s Jerusalem 1988, lot 262; Sotheby’s New York 2006, lot 186; Weyl 1979, pp. 47–51.